The calls of night-jar and owl punctuate the stillness of the hours before dawn. Four in the morning and the man who lights the fires under the hot water boilers has been and gone. I lie, wishing for sleep, knowing it’s gone for the night. We must be on the road again, soon. I don my pink shower cap with piggy ears – yes, really – relish the warmth of a quick shower and towel myself dry, as fast as I can, in the five o’clock chill. Archaeo-man has fetched the sandwiches he made last night from the camp kitchen and by twenty past five we’re on our way. A first cockerel has begun to crow but there’s not even a hint of sunrise. 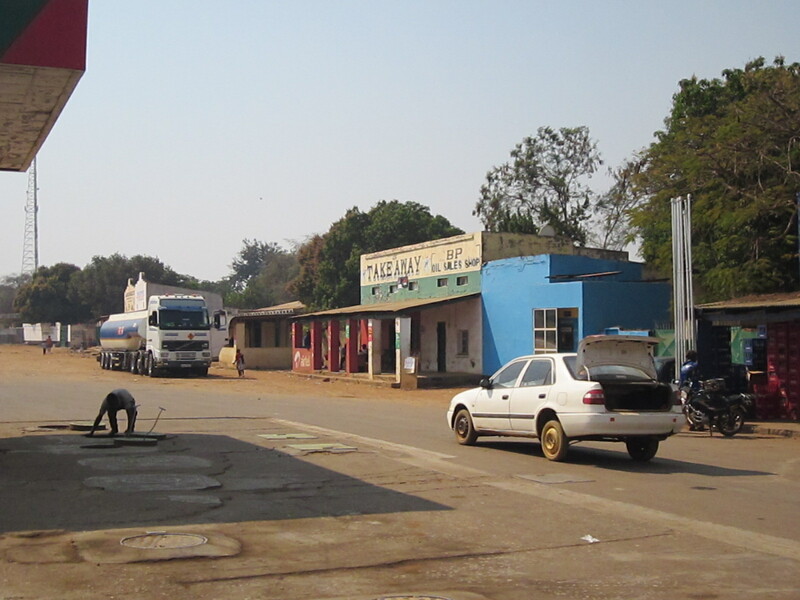 The road sign says ‘Chipata 554 km’ but we’re going further – quite a bit further, the distance best left a mystery so as not to dampen the traveller’s spirits. As we drive through the dark on the Great East Road – a single carriageway but a major artery – we adopt the ritual of night right-indication – it lets the oncoming vehicles see exactly where your boundary lies. The road is wide enough for two big lorries – but only just – and many are ancient, weighed down with overwhelming cargoes – bulging bundles of cotton, heavy sacks of charcoal and people, invisible in the dark, wearing blankets against the cold. We pass a vehicle with hazard lights flashing on the other side of the road. A man is desperately flapping his arm in the ‘give me a lift, please’ manner that’s customary. We drive by on the other side. Our vehicle is an old Toyota Condor that’s seen better days, all enclosed. If it were a Land Cruiser with an open back … But it isn’t. The Foreign and Commonwealth Office advises travellers here not to drive at night – or pick up strangers. We’re semi-compliant, but uncomfortable. He’s not the last. But he was the most urgent-looking. An hour later and signs of a pink blush appear in the sky, no longer an impenetrable wall of darkness. The air is fresh, not yet dusty and heat-laden. Dawn comes with a change of scenery. The flatness of the greater Lusaka area gives way to hills, the hills give way to – I guess – mountains. The flush of spring is beginning to touch the miombo woodland that covers the slopes like a fuzzy down. Leaves are falling like soft rain and a patchwork of yellow, pink, red and green is a sign that this southern hemisphere winter is on the wane. As is the chill. We climb higher but it’s not cooler, not at all. Pulling off the road to a lay-by strewn with rubbish and broken glass we relish the majestic views, eat our breakfast of ham and tomato sandwiches and take the chance – between the relative privacy of two card doors and a lull in the traffic – to pee. Metal road barriers, twisted like soft liquorice, lie beside steep drops. Burnt out vehicles sit beside the road, ghost vehicles waiting for other-worldly passengers. Beauty and danger. Risk and reward. Archaeo-man is a cautious driver. Steady and not too fast. A slight shudder in the wheels he attributes to a change in road surface. And so it goes. And on we go. Hot, now, windows open, hours pass. It’s about half past ten when we reach the town of Nyimba. There’s a petrol station, we decide to fill up while we can. The town is looking tired – not just because it’s Saturday morning and the beer was flowing on Friday. The ‘restaurant’ where Archaeo-man bought goat pie (complete with goat hair) on his last journey through looks shabby – and decidedly unhygienic. In gear and off again. We swerve around as if drunk (we’re not) avoiding potholes, a skilful game played with two directions of traffic. Fortunately – for the moment – there’s not too much. 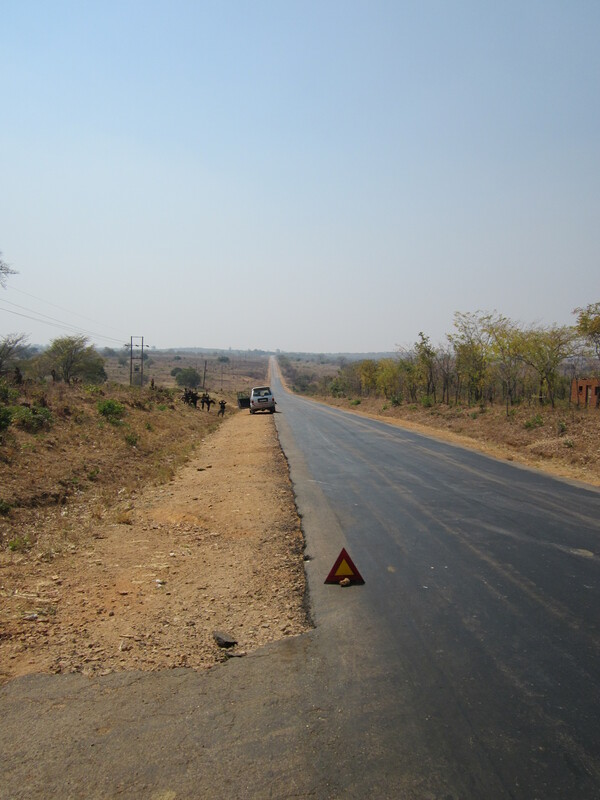 The road has deteriorated with every kilometre since we passed Luangwa Bridge, a couple of hours ago. Now it is barely wide enough for the traffic. Each passing, speeding lorry rocks our 4×4. There’s now a distinct shuddering and the car veers to one side. I pray it’s only a puncture. Archaeo-man jumps down, inspects the wheels and tyres, climbs back in, shrugs. It’s been about twenty minutes since we filled up. A goat runs into our path and we swerve to avoid it. The shuddering starts again but now it’s much, much worse. The car jerks to a sudden halt with a horrible shriek. We’re stopped dead in this narrow road. I don’t want to describe that moment. That sickening, instant realisation that it’s over. Five hours. Halfway to nowhere, now. Fifteen kilometres from the nearest town, hundreds from Lusaka. It’s as if we’ve been struck. We both know, without exchanging a word. We’re in trouble. It’s vital we get the vehicle off the road but the front wheel’s at a crazy angle and we can’t even push her forward. Reverse works. The two rear wheels drag us back onto the verge – mostly – before the vehicle refuses to budge a further inch. The road is scratched in a bizarre pattern, fragments of metal leave a silver trail. We put up red warning triangles to the front and rear as local children, barefoot and dressed in rags, appear. Archaeo-man pulls out his cellphone and calls the hire company. Assuming they’ll help. This entry was posted in If you only read one ..., Zambia and tagged 4x4, Africa, Chipata, Great East Road, Luangwa Bridge, Lusaka, miombo woodland, Nyimba, Travel, Zambia. Bookmark the permalink. I’m getting there… still feeling wraith-like! Omigod. You will Lidipiri, you will. Meanwhile, it’s no joke. I had one like that in Arabia, the wheel came off. A front wheel came off my (well, my employer’s) Toyota Land Cruiser. But I was only half as far from anywhere as you are/were(?) and there was more traffic, mostly Datsun pickups – though no mobile phones in those days.